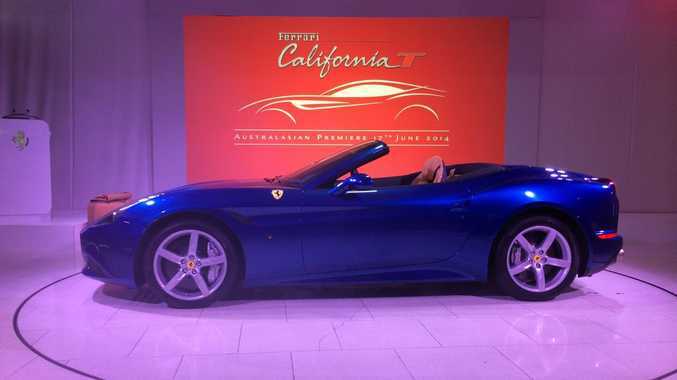 The new California T was launched in Australia today. FASTER and about $50,000 cheaper than the model it replaces, the new Ferrari California T is poised to power into Australia. A left-hand drive showpiece is about to tour Ferrari dealerships Down Under over the next month, aiming to build on a "healthy order bank" who have already put their names down for the $409,888 drop-top. The "T" stands for turbo, the first force-fed model from the Prancing Horse in two decades. With a 3.9-litre turbocharged V8 under the bonnet it can now reach 100kmh from standstill in 3.6 seconds, which is 0.2 seconds faster than the old model. The biggest gain comes in 0-200kmh, which at 11.2 seconds is more than two seconds quicker. But it's not all about figures and going fast in the Ferrari California T.
They call this your "everyday Ferrari". Since it was relaunched a few years back, the California inspired a new legion of fans - 70% of clients who bought the previous model were new to the brand. Research has found the California was not just a showpiece, with 30% more mileage and 50% higher daily usage compared to any other Ferrari. And more than half of all journeys were driven with a passenger on board. "This model is the epitome of sublime elegance, sportiness, versatility and of course exclusively which has distinguished every California model since the 1950s," Ferrari Australasia CEO Herbert Appleroth said. "This new model has a lot of innovation, beginning with new V8 engine, the latest F1-Trac traction control as well as the most advanced suspension and dampers that Ferrari knows. "The design has a whole new personality. The only thing we have kept from the previous model is the overall length and the retractable hard top roof." Ferrari California T: The new Ferrari California T was launched in Australia today. It blends old and new, drawing on design inspiration from the 250 Testa Rossa in profile. The bonnet has muscular wings on either side which incorporate the wedge-shaped LED headlights. New door and sill designs are more sculpted, while the 19-inch alloys with a large tyre wall point to its comfort focus, rather than purely being for track prowess. From the driver's seat it's a sporting view, sitting low in the soft leather seats. The steering wheel features the red start button, along with suspension and damper control settings along with a typically athletic toggle for various traction control modes. Sitting between the two air vents on the dash is a touch-binnacle, which enables you to scroll between time, turbo efficiency and turbo psi by just tapping the outside of the gauge with your fingers. Double stitched leather adorns all the most important parts of the interior, of which you can choose between 15 million colour combinations. Yet this is the everyday Ferrari, and practicality is not forgotten. There actually is a back seat, and adults can fit...sure the occupants up front have to slide a long way forward and it's tight, but accommodating four can be done. You can also take the kids, with Isofix car seat anchorage points in the back. Boot space is impeded with the roof down, but you can at least fit a couple of small bags. The Ferrari California T is available in red and blue. Right-hand drive models are expected to arrive later this year. The national tour will encompass Melbourne, Adelaide, Perth, Brisbane and Sydney, then over to Auckland in New Zealand, over the next month. Details: Two-door rear-wheel drive performance convertible. Engine: 3.9-litre turbocharged mid-front-mounted V8 generating maximum power of 412kW @ 7500rpm and peak torque of 755Nm @ 4750rpm. Consumption: 10.5 litres/100km (combined average).